Bushnell E2104 Elite 2.5-10x40 Riflescope E2104 FREE SHIPPING! The Bushnell Elite 2.5-10x40 is an advanced riflescope designed to perform in varying weather and lighting conditions. Its Ultra Wide Band Coating and fully multi-coated optics deliver a bright, clear image by maximizing light transmission across an extended portion of the visual spectrum. A Rainguard HD coating applied to the external lens surfaces also maintains visibility in wet conditions by breaking up water droplets to reduce light scattering. It features a classic Multi-X reticle, and the precise windage and elevation controls make it easy to place your shot on target. The durable one-piece aluminum tube is extensively recoil-tested, and comes with an argon gas filling that prevents fogging and keeps out water. 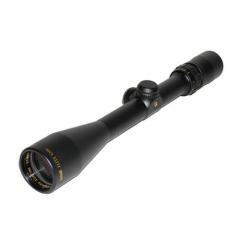 ©2002-2019 CopsPlus.com: Bushnell E2104 Elite 2.5-10x40 Riflescope E2104 FREE SHIPPING!